Answers to your most common FlyFoe questions. FlyFoe's franchise fee starts at just $17,000 and includes the price of your base territory. We offer discounts for military veterans and special incentives if you're already in the mosquito/tick control business and want to convert to a FlyFoe franchise. FlyFoe's royalty fee starts at only nine percent (9%) of gross sales and decreases to as low as six percent (6%) as your mosquito franchise grows. Imagine the savings in comparison to the typical flat ten percent (10%) royalty fee charged by a few other mosquito and tick control franchisors! Of course, these lower operating costs translate into greater profit for you. And, we only bill the royalty fee once per month vs. every week. Is there a national marketing fee? FlyFoe charges a modest one and a half percent (1.5%) national marketing fee that is directed towards local and national marketing programs. Most other franchises charge a full two percent (2%) or more of gross sales for national marketing, which brings your ongoing fees to nearly twelve percent (12%) of your gross sales. FlyFoe, we think you should be the one who decides where and when you spend your marketing dollars. FlyFoe has a dedicated staff of business coaches to support franchise owners. Our business coaches work with franchisees in a very personal way. There are no highly structured monthly calls. Business life just doesn't work like that. Sometimes you'll need to make a quick call out of the blue. Other times a text will suffice. There are times when you'll need a few hours to really discuss a situation. Business coaches are just that, coaches. They provide advice and are that second set of eyes to keep your business moving forward. What marketing services do you offer? FlyFoe has some of the most creative and effective marketing materials in the industry. FlyFoe allows you to manage most of your marketing needs through our exclusive intranet site and vendor network - it takes just minutes to send a direct mail piece to a demographically targeted list, place pre-printed inserts in your local newspaper or order marketing materials like magnets or car wraps. We utilize dedicated, in-house experts to incorporate local search engine optimization (SEO) into our content marketing strategy to drive traffic to franchisees' local web pages so that their mosquito and tick control franchise will be visible in consumers' online searches. FlyFoe is a leader in digital marketing including pay per click (PPC) management, directory management and other on-page and off-page strategies. What is your franchisee training like? At FlyFoe, franchisee training can start from the moment you sign the franchise agreement. In many cases, by the time someone signs a franchise agreement, they are well on their way to learning the ins and outs of the business. FlyFoe’s initial franchisee training is broken down into 3 sections. The first section is all the training you'll do prior to the official "training week". The second section is the week of on-site training that you'll do at FlyFoe headquarters. And the third section is post training and follow-up during your first few months in business. Once the agreement is signed, you'll immediately be given access to our Intranet which serves as our collective knowledge base. You'll be assigned a personal training coach, who will guide you through the training process and initial business setup. There are usually 6-12 weeks from agreement signing to the training week. During that time you will get your truck(s) and equipment ready and attend workshops and training webinars to familiarize yourself with our software. The goal is to do as much training as we can before you come in for the on-site week. Then comes the on-site week, which is, on-site here at our Boston headquarters. Training is a full week and usually runs 8a to 5p. You'll receive hands on training from our local technicians, you'll meet and work with a number of our support teams like our National Sales Center, Marketing and Operations departments, and you'll have many meals with the founders and other executives. This is not only your time to learn how to run a FlyFoe but also a great time to connect and get to know each other. After training you'll be ready to open your doors. Training doesn't stop there. Training is really a lifelong affair. Those first 90 days after a business are critical and we'll be there to help you every step of the way. At FlyFoe, we don't train more than two new owners at a time. Many Franchisors put 4, 5, 10 or more franchisees into the same training session. They'll have all the reasons why training in larger groups is beneficial. Some will have you watch videos while at their headquarters. Others you won't even have but a cursory 10 minute meeting with the Founders...and that's if they are even around anymore. We are personal at FlyFoe. And we take that very seriously. FlyFoe is so technically advanced, that in many respects, we are a software company. FlyFoe's proprietary (that means we are the only ones that have it because we built it ourselves) business management software is truly amazing. The cloud-based system is so simple to use that we can train you to use it in a day. You can access it from any computer. Want to use a Mac? Go ahead. Want to log in from an iPhone, iPad or Droid? Go ahead. With FlyFoe's management system, there's no need to back up your software. There's no installing. There's no upgrading. And, there's no more hiring computer geeks to configure your office computer network. 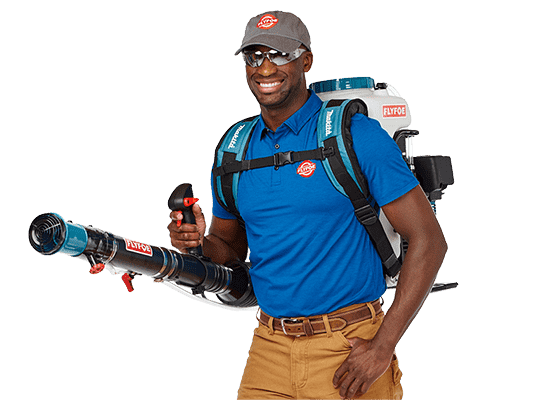 FlyFoe's Cloud software has a simple, functional design that helps FlyFoe franchisees operate their residential cleaning company in a way they couldn't have before. The cloud-based application handles all customer management including scheduling, billing, employee routing, payroll, invoicing, marketing, reporting and more. Our software and website are nicely integrated. New customer leads show up instantly in your software. Emails requesting feedback are automatically sent to customers and their response data is logged in our cloud software for immediate action and reporting. Not only is our software amazing at running the business, it has a built in idea portal where you can post ideas and every user can vote them up or down. If you have an question, simply enter a case directly in the software. Nothing falls through the cracks and you can track who answered your question and what they said. Since we built the software, we are not beholden to a software company's release cycle. If we want to push a new feature out tomorrow, nobody stops us. And more importantly, if we want to keep features that we won't be using from clogging our screen real-estate, we don't add it. Everyone makes the claim of having the best software, but we will prove it. We are so positive that our system is superior that our CEO challenges the CEO of any of the other franchisors to a live, side-by-side comparison. Go ahead, help us see if anyone will take our challenge. We can easily do a comparison with any web sharing application like Gotomeeting. Or, just come for a visit and we can show you in person. You'll love it. How does FlyFoe determine one's territory? At FlyFoe we don't have pre-built territories. We talk with each of our franchisees personally and create an exclusive territory that will help meet their business goals. Along with a detailed review of demographic data in your area, we listen to you about the local nuances. We'll work together to come up with the perfect territory. Can I negotiate aspects of the Franchise Agreement? The simple answer is "no". While we do update our Franchise Agreement annually, we don't make adjustments on an individual basis. We have some very good reasons not to do so. You see, many other franchisors will changes terms from one franchisee to another. Many do this in order to "sell" the franchisee. There are many problems with this. First, as a franchisor, we would have to manage different legal terms for every franchisee. Second, every franchisee would be wondering if they got the best deal. Franchisees would be asking each other what their royalty fee percentage is for example. Do you think that adds to franchisees getting along? It doesn't. At FlyFoe, we've put together a very fair agreement that we feel comfortable standing behind. We don't negotiate because it's best for everyone involved, not because we're hardheaded. When I become a franchisee, will I be on my own when I start up my business? FlyFoe offers every franchisee a multi-week extensive training program that consists of the right mix of at-home training along with hands-on and classroom training right in the FlyFoe headquarters. After completion of this program you will feel confident opening the doors of your mosquito and tick control franchise. Our training and support doesn't stop there - you will be assigned to a dedicated coach to support your journey in business ownership from startup to maturity. Where is FlyFoe headquarters located? We are headquartered in Boston, MA. Being located in Boston, we have access to the most highly trained software developers and marketing experts in the country. Many of the country's top universities, including Harvard and MIT, are only blocks away from our office. This location means an extraordinary pool of talent and resources are available to us - all to better assist you. Come visit us! Based upon our discussion, if we both feel you may be a good match for FlyFoe, we will extend an invitation to tour our headquarters. You will meet the FlyFoe team, see our facilities, preview our software and marketing materials, and get a first hand look at the FlyFoe system. What are some qualities of a successful FlyFoe franchisee? This is an interesting question. While there is no single quality that determines success, there are a few qualities we've noticed over the years that certainly improve one’s odds of being successful. Here is a partial list...in no particular order. Successful Franchisees like people. They enjoy personal interaction and work well with others. Successful Franchisees speak clearly and confidently. They inspire trust and confidence. Successful Franchisees understand that technology is important. They are willing to invest in systems. Successful Franchisees are open to new ideas and spend time learning new concepts. Successful Franchisees have a vision for their business and what type of culture they want to create. Successful Franchisees are good with numbers and accounting doesn't scare them. Successful Franchisees love to be hospitable. Making customers happy is fun for them. Successful Franchisees can check the drama at the door. Life happens, but they can keep it out of the office. Successful Franchisees feel that they are lucky. Successful Franchisees are coachable. They understand even someone as talented as Tom Brady (ok we're in New England) has a coach. I'm glad you asked. FlyFoe is certainly different from all the others and we planned it that way. First, FlyFoe is only 6 characters. Shorter names are better. There's a reason Kentucky Fried Chicken is now KFC. There's a reason Federal Express changed their name to FedEx. It's easier to type, easier to remember. People want quick and simple these days. FlyFoe is different. Marketing is all about differentiation. We stand out while the others are so similar people confuse them. The word Mosquito is too long, too hard to spell and requires another word to try and make them unique. Talk about consumer confusion. And who wants a 13 letter domain name...nobody. And FlyFoe gives us wings. It allows us to go into other areas of pest control without pigeonholing us into one line of work. You might have been told that not having "mosquito" in the name would make it harder for search engines to find us. Why don't you ask Apple if they can be found when people search for computers. These days it's just not true. FlyFoe is a bold and fresh name. But hey, we get it if you want to be boring.